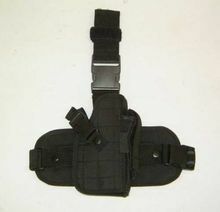 This sturdy nylon leg holster, that straps to your thigh and belt, will accommodate most medium to large frame hand guns. Fully adjustable for any person. 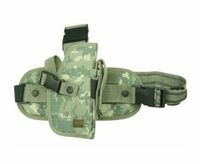 Attaches to belt and thigh for maximum stability. 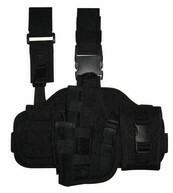 Also available is a black Taigear thigh holster, the TG221BL, that is for Left Handed shooters. Last pic illustrates this model.